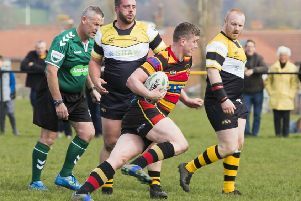 Skipper Dom Walsh scored a converted try with two minutes left to give Heath a 19-12 win away to Yorkshire One’s bottom club Yarnbury yesterday. Their three tries to nil victory in an error-strewn game left them sitting more comfortably in fifth from bottom position. Heath opted for the same team which had performed well in December. Chris Piper returned from injury alongside Jordan Moana and Lewis Barrett on the bench. In perfect conditions, Yarnbury kicked off down the slope and won a scrum in front of the posts when Jordan Bradbrook knocked on. Heath survived, gradually moved up the pitch and a clever kick from James Robson set up Heath’s first attack. Yarnbury made use of stand-off Kieran Davies’s huge boot. A clearance led to another Heath mistake and Yarnbury kicked a penalty for a 3-0 lead after eight minutes. When Ben Maxwell stole line-out ball, it was moved via Robson, Ezra Hinchliffe and Jack Sheldrake to full back Bradbrook, who scored an unconverted try in the corner on 14 minutes. The Yarnbury response was positive and they regained the lead through Davies’s penalty after 17 minutes. Both sides settled but constantly kicked the ball away before Sheldrake made a tremendous break on 30 minutes but he elected not to pass the ball to the supporting Luke Saltonstall and a certain try was lost. This injected life into the game. With Walsh urging his players on, the ball went from side to side and Bradbrook put a foot in touch as he touched down on 32 minutes. Yarnbury stood firm under pressure and another huge clearance from Davies resulted in another Heath mistake and Yarnbury landed their third penalty for a 9-5 lead at half time. Coach Dave Harrison let his feelings known in no uncertain terms and sent on Piper and Moana for Chris Moore and Fergus Marsden, resulting in more possession. On 45 minutes Robson was replaced by Lewis Barrett, who went to centre with Hinchliffe moving to stand-off. The reliable Matt Beasty was making his presence felt and he and Maxwell won ball. Bradbrook made ground before Luke Saltonstall went in for a great try on 55 minutes. Hinchliffe’s conversion made it 12-9 to the visitors. Heath were on top against a flagging home side but Moore, back on for Olly Cook, was sin-binned on 62 minutes and this seemed to inspire Yarnbury. A Davies drop goal sailed between the posts to make it 12-12 with 10 minutes left. Both teams scrapped for a decisive score. Howard Hanks was everywhere and he stole the ball to set up a Heath attack. The pack surged forward and Walsh popped up to touch down and Hinchliffe converted.